Country View Crafts had a Tim Holtz challenge this month. So I made some simple cards. It started when I was mucking around with some Ranger texture paste, colouring it with silver paint, and mixing ultrafine glitter from Elizabeth Crafts to the paste. And then I put it through the Tim Holtz Gothic Stencil. I also wanted to try out a technique I'd seen from somewhere (I can't remember where), where you scribble markers onto acetate and then use it to smoosh over a stamped and embossed image to make a cool background. 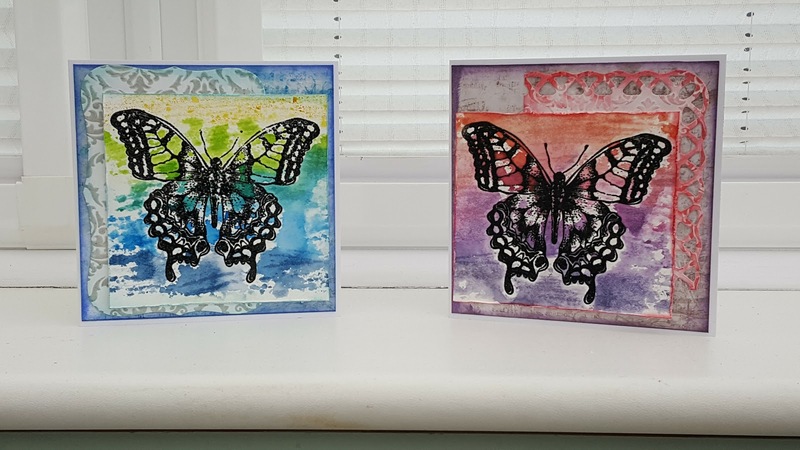 I heat embossed the swallowtail butterfly from the Perspectives stamp set. and then used a variety of Distress Markers to make a rainbow style background. (the original video used Tombow markers). I used Distress Inks to edge the watercolour, and the texture paste piece, and layered them onto some papers from the old French Industrial paper stack. Great smooshing! Love the design and colours. Thanks for joining us at Country View Challenges this month!